Roy Williams is Carolina’s Hall of Fame basketball coach, his name permanently signed on the court at the Dean Smith Center. He is among the highest-paid coaches in the country, earning a seven-plus figure income. But it did not start out that way. Forty years ago, Williams, his wife Wanda and their year-old son Scott moved to Chapel Hill to take a part-time position on Dean Smith’s staff. They settled into a two-bedroom apartment at Glen Lennox, and that community became home to the Williams family for three years. They first lived at No. 36 Hamilton Road, and after one year moved literally next door to a three-bedroom unit because daughter Kimberly was on the way. “Sometimes when I am coming back from the mall,” Williams says whimsically, “I will take the short cut through Glen Lennox and pass that first apartment, and I will think I’ve come a long way since then.” But Williams has fond memories, and some funny ones, of his first home in the town where he is now the most recognizable figure. 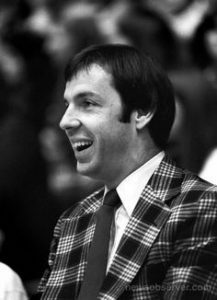 Roy Williams moved into Glen Lennox in the summer of 1978. He remembers that late August day in 1978 when he drove a U-Haul-It truck from Asheville and the high school coaching job he left to accept an NCAA-mandated $2,700 annual salary at UNC. Wanda and Williams’ mother were following the truck in the one family car, a beat-up Mustang with a broken rear window. He found one. Wanda wore it and began teaching at Chapel Hill High School the very next morning. Meanwhile, Williams had to finish most of the unpacking and get ready for his first meeting in Coach Smith’s office the next day — but Wanda had taken the family car to work. As it still is today, Glen Lennox had young families and kids play on the grounds behind the apartment buildings. And it was close enough for the other coaches and counselors at the UNC summer basketball camp to spend their afternoons off hanging out at the Williams pad. The one bittersweet memory Williams has of living at Glen Lennox was a matter of convenience. In his first season as a college coach, the sixth-ranked Tar Heels lost their first NCAA tournament game to unranked Penn, the same afternoon Duke also lost to St. John’s on N.C. State’s home court in Raleigh. The bus slowed down but never pulled over. It stopped in the middle of the road, and Williams jumped off. He walked down Hamilton Road to his young family in Glen Lennox, the only comfort he could find on Black Sunday.